The new PIP6-11 from MPL AG comes with a Intel® Atom™ Z530P processor, allowing to operate the system with environment temperature up to -40°C to +75°C without the need of a fan. The maintenance free design is ideal for 24/7 operation, even with high temperature and in extreme environments. MPL expands the line of Embedded Industrial Computers with a new member. The heart of this new PIP6-11 is the Intel® Atom™ Z530P CPU, allowing to operate the system from -20°C to +60°C and optional even from -40°C to +75°C, without throttling or the need of a fan. The PIP 6-11 is certainly a maintenance free design for 24/7 operation, even with high temperature, vibration, and in shock environments. 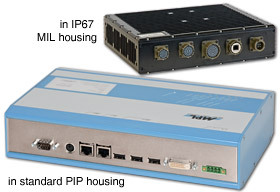 The product family comes in three housing heights as well as in a IP67 housing. The PIP6-11 has been designed and developed in Switzerland based on more then 27 years company tradition and a huge know-how in lowest power consumption and extended temperature operation. According to the company logo "MPL High-Tech • Made in Switzerland" all products are 100% manufactured and assembled in Switzerland by MPL AG.